Chinese President Xi Jinping’s first state visit to the United States starting September 22 is very timely and needs greater deliberation over immense anticipation. Xi’s visit comes at the opportune time when US is steadfastly preparing itself for the 2016 Presidential Elections equated with 70th anniversary of the formation of the United Nations, wherein Xi Jinping will address the UN General Assembly. Besides, most importantly, the Xi-Obama talks will unfold in the influx of widening differences between the two parties over a variety of issues such as cybersecurity, skewed economic exchanges and trade policies paralleled with their locked horns in the Asia-Pacific resulting from China’s land reclamation activities in the South China Sea and others. In this backdrop, China’s confident military posture as displayed in the September 3, massive military parade coupled with Xi Jinping’s grand vision of “One Belt, One Road” Initiative of connecting Asia to Europe- which evidently challenges the western order, will give an impetus to the pressing issues between the two countries. In this state of rising security dilemma between China and US, Xi’s US visit is envisaged by greater anticipation related to US sanctions on China on the pertinent question of the growing Chinese cyber theft of US intellectual property- which can be one of the strong impediments to the Xi-Obama talks. Adding to China’s concerns will be the protectionist policies vis-a-vis Chinese investments in US. Given this, Xi Jinping’s ‘Seattle talks’ which is expected to bring in a wide range of Chinese and American business leaders is deemed to provide some impetus to the declining China-US relations. And most importantly, for China’s own domestic concerns when it faces a “new normal” in economy. Hence, in this paradox of defined insecurities based on strained ties and limited common interests, whether the glass will be half full or half empty after the Xi-Obama talks remains highly questionable. For the strategic distrust embroiled in great power disparities is likely to impede the Sino-US interaction to be realised in true potential. In this juncture, it is important to note, that Xi’s visit will act as a critical factor in determining the future course of the Sino-US bilateral relations with significant implications for the world at large. In this aspect, the ‘India factor’ will weigh strong in the strategic domain of Sino-US talks. For in the recent past, US-India relations have strengthened as it embarked on a joint strategic vision of securing their common interests in Asia, which invariably aims at putting a counterweight to the rising clout of China in all aspects such as economically, geopolitically and strategically. Though the strategic distrust between China and US as manifested in their differences vis-a-vis China’s muscle flexing equated with US pivot to that of China run Asian Infrastructure Investment Bank (AIIB) and Silk Road Diplomacy- provides India a strategic advantage in its relations with US over China. In this context, Xi’s US visit doesn’t unnerve India much. For at all ends, rather than pressing US to weaken its ties with India, for Xi the major motivation is to mend its own ties with US which faces a severe decline. And specially China needs to reconfirm and reassure its strategic engagement with US- wherein ‘cybersecurity’ is placed at the top of the agenda. In an overall assessment, for India, Xi’s US visit rather acts a strong card that will reboot its own ties with the US. But the only concern for India to be expected is that in the domain of ‘Climate Change’- where India can face some hard talks. What can be stated is that Xi Jinping's state visit to US is deemed more likely to meet the ‘sticks’ more than the ‘carrots’. The tensed atmosphere adds to China’s anxieties vis-a-vis the way Obama will play the diplomatic game. 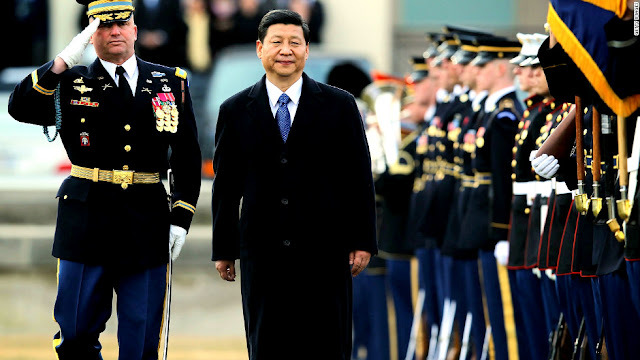 Since for China the stakes are high both domestically and globally, thereby, it is expected that US will not constrain from arm twisting China in many ways. As power is driven by interests therefore, US too will play the power card to derive its interests but for China to play its power card in full potential comes with a question mark. And in this light, where both China and US are at logger heads, India automatically gets an advantage and faces no threat vis-a-vis China-US ties. So, the watch of the hour is whether Xi Jinping’s visit will be able to make a breakthrough from the vestiges of a growing strategic distrust or will it get much severe with United States strong policy actions. Amrita Jash is a Doctoral Candidate at the Centre for East Asian Studies (Chinese Division), School of International Studies, Jawaharlal Nehru University, New Delhi. She is the Editor-in Chief at IndraStra (New York) and a Contributing Analyst at the Asia-Pacific Desk with Wikistrat (Wash-ington DC). Thomson Reuters Researcher ID is K-5665-2015. She can be reached at: ajash108@gmail.com.